Sometime, by chance, a blind man may catch a hare. In December I visited an exhibit of early experimental photography at the Museum of Modern Art. It was broader and more eclectic collection of such photographs than I’d seen before, and I was particularly taken with the photomontages—composites of layered images that were alternately haunting, beautiful, or hilariously pretentious. I returned home with a peculiar inspiration: get a computer to make more of them. After a few nights and weekends I had my program: a Python script that can churn out thousands of ersatz avant-garde photomontages in an hour. The “creative” process is completely hands-off—the computer does everything. I just curate the output and pick my favorites. I think some of them are pretty good. If you disagree, you won’t hurt the artist’s feelings. It’s not “computer-generated art”. The source material, random images extracted from public domain books, were all made by humans, and some of those humans were artists. The computer is just culturally appropriating us. I felt I had to decide whether the project was “Dada” or “Surrealist”. Like a lot of casual enthusiasts, I often use the terms interchangeably, so I spent a couple weeks doing actual research. This more than qualifies me to write an article on the internet. I’ve concluded that the program is Dada—lacking in meaning, anti-art, assembled from “readymades”—but that the work is Surrealist — strange, surprising, heavily random, but not total visual noise. Dada employed randomness as an expression of nihilism, a metaphor for merciless modern war and economic injustice. My software isn’t a person and doesn’t do metaphors. It can’t help but produce imagery that’s intrinsically meaningless. The work is the subset of that imagery that, as a human, I decided signified something. It might signify comedy or tragedy or synchronicity; it might amuse us or unsettle us; it might be strangely beautiful or just strange, but I pulled each image out of the slush pile for a reason. Randomness is only a creative input to the project, not its reason for existing. That makes it Surrealist. 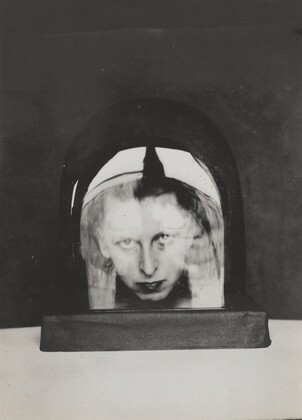 Blending images was a technique used by many different artists of the early avant-garde. As is often true for new forms of expression, artists wanted to show off the process itself. Early collages were ragged, literally cut and paste, with visible seams between the composite images. They looked like what they were: distinct visual elements glued together on a page. The Surrealists preferred softer photomontages achieved in the darkroom. Their process would produce a single image which, while obviously a composite, felt stylistically whole. The desired look was soft, dreamlike, sensuous. One of the few “aesthetic” judgments that my program makes is to prefer combinations of images that are computationally different enough to be interesting. My favorites tend to be visually harmonious, in line with Surrealist principles, but thematically contrasting: a dainty illustration blended with an artifact from an old book, or an angelic panel of women swallowed by a machine. Quick, name your favorite female Surrealist! Not listed was Claud Cahun, who orbited in Breton’s circle yet was never fully accepted. She presented as a lesbian but her gender identity was mercurial: “Neuter is the only gender that always suits me.” She had drifted away from the core Surrealists by the time the Second World War erupted and fled to the British island of Jersey with her partner. The pair of them recklessly but anonymously blanketed the island with anti-Fascist propaganda—for four years!—before they were caught and sentenced to death. Their execution was indefinitely deferred in part because her captors could not accept that they had no male co-conspirators. “They were forced,” Cahun wrote, “at the end of the day, to condemn us without believing in our existence.” Cahun’s work was difficult, disturbing, and is mostly lost, due to outright destruction by the Nazis but also indifference. Until very recently she was virtually unknown. And now I see with eye serene / The very pulse of the machine. Surrealists were fascinated by the eye. They obsessed over its aesthetic beauty and employed it as a metaphor for the unconscious (Surrealism had a misguided if understandable affection for Freudian theory). “The eye exists in its savage state,” André Breton wrote, believing that the sense of sight was immediate, unsullied by rationality, and therefore the purest entryway to the true self. I don’t believe in the unconscious in the same way, but eyes are striking. They’re so stereotypically “Surrealist” that I found myself gravitating towards any composition that emphasized them. Has the artist any function in a machine-age society? Neither of the artists above took these photos. 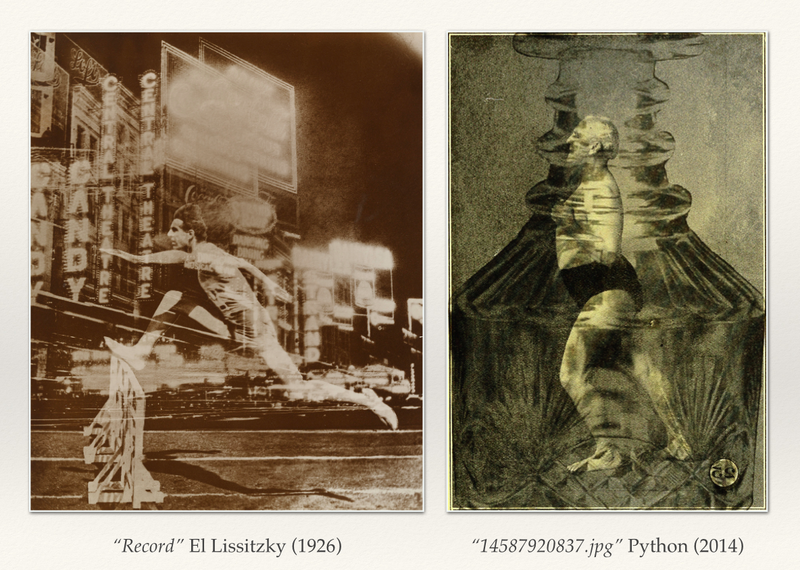 Lissitzky didn’t photograph the street montage (that’s an uncredited Broadway bei Nacht by Knud Lönberg-Holm), and the runner is from an unknown book. It’s not real art, but Python’s composition is funnier and more honestly appropriated. Breton claimed to believe in “objective chance” — that seemingly random events would reveal themselves to be predestined expressions of human desire. One morning you would be drawn to a strange object in a flea market; weeks later you would realize you needed that exact thing. The specific theory of objective chance died with Breton, but the loosely defined concept persists. It’s recapitulated in formal theories like Jung’s synchronicity and really disappointing movies like Signs. Humans are born pattern recognizers, but that skill is not unique to us. Sheep learn to recognize individual sheep (and humans and dogs); reptiles and amphibians learn quite a bit in life and rely less on instinct than previously thought. To learn anything requires close observation of a noisy world and to extract patterns from it. As humans we’re evolutionarily predisposed to find meaning in random signal. Breton and Jung had the causality of chance backward, and while that makes them wrong, it doesn’t make them foolish. Even the most rational among us have experienced seemingly magical coincidences that we stubbornly hope have some underlying narrative. One of the things I love about projects that use randomness, whether they’re twitter bots or computer-generated literature or just analog Surrealist party games, is that they force to admit that sometimes interesting things just happen. Objective chance is an unnecessary adornment on a wonderful aspect of life. Any one of us, no matter how ugly, untalented, unloved, or unhuman, might—by regular old random chance—create something beautiful. A complete photoset of the works are on Flickr. The source code and the images are in the public domain. All unattributed works in this story are by Python. Unlisted Thanks to Dan Schmidt. No rights reserved by the author.